On 27 January 2019, total storage levels in Greater Sydney reached 59.9%. 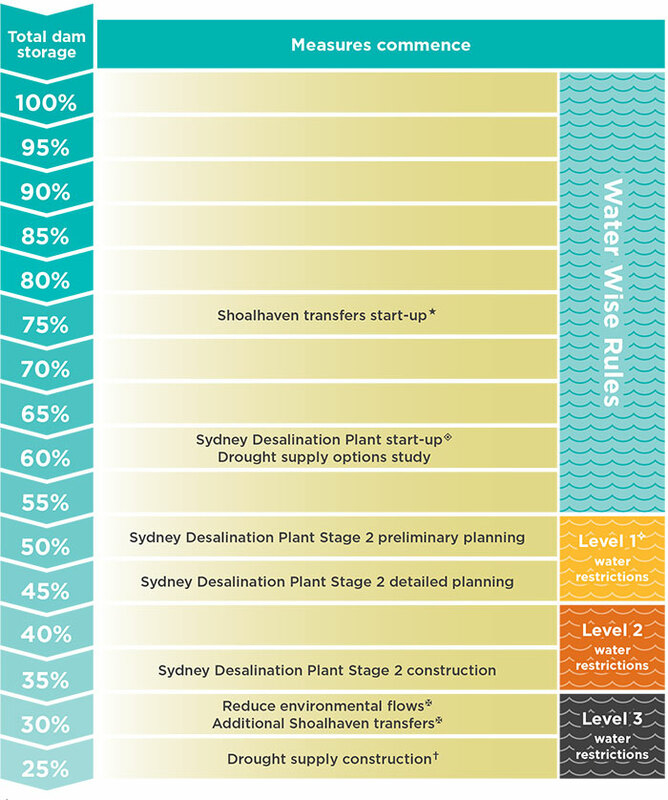 As part of the NSW Government’s 2017 Metropolitan Water Plan, when total storage levels fall below 60% the Sydney Desalination Plant (SDP) is notified to enter start-up mode. Desalinated water will help meet customer demands as the drought intensifies. Sydney’s water supply is otherwise entirely dependent on rainfall. Unlike many regional catchments facing drought, Sydney has at least two years of water supply remaining – even with zero inflows. Sydney typically receives annual rainfall exceeding 1200mm. WaterNSW will continue to provide regular updates on storage levels. Below shows the trigger points for activities. Phone 13 20 92 or via their website.